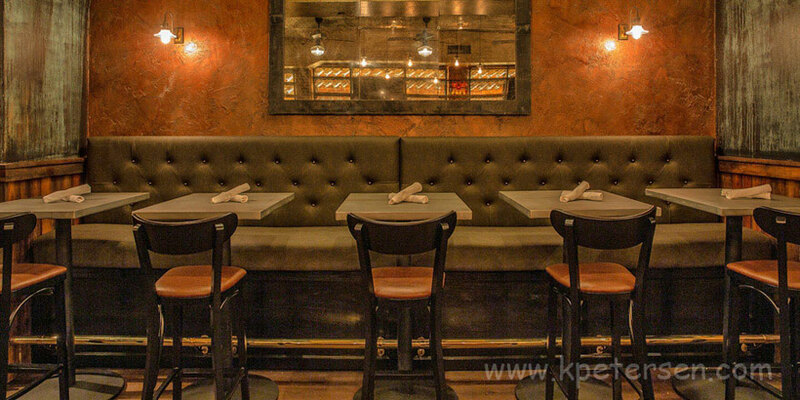 How much do Upholstered Restaurant Booths cost? There are many, many options and modifications available. Also, the size of your project will go a long way in determining how much you'll pay. Anyone can be competitive on a large order, we can be competitive on the medium and small ones too. 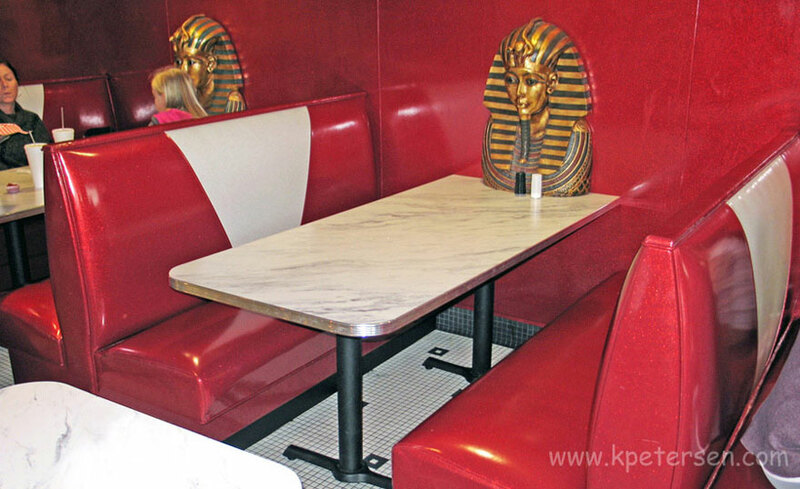 For fast, precise quotes on upholstered restaurant booths please contact us by telephone. 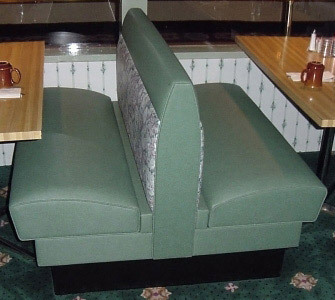 Can I get an Upholstered Restaurant Booth for my house? Sorry, the shops we work with are set up for commercial, industrial and institutional projects. Also, crating and the cost of shipping charges for small orders to residential destinations most often make such purchases impractical for everyone involved. 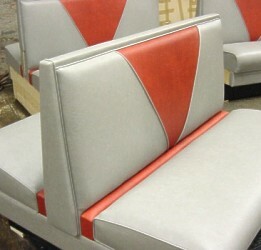 There are hundreds of commercial vinyl upholstery materials available. Our best prices and best delivery times can be had by choosing Solid Color Vinyl Upholstery and Premium Zodiac Glitter Special Vinyls. What booth sizes and configurations are available? Duece Booths Typically 24", 26" And 30" Seat Lengths. Four Seat Booths Typically 42", 44" and 47" Seat Lengths. 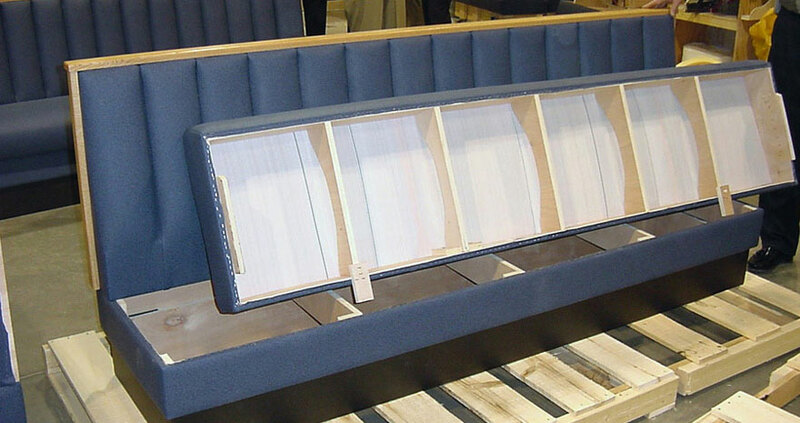 See Some Upholstered Restaurant Booth Layout Examples. 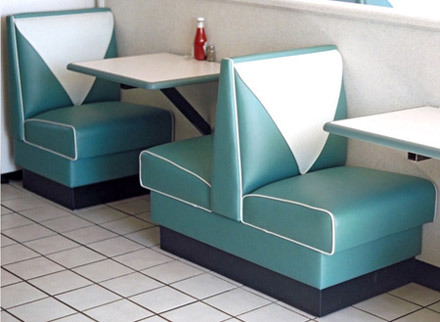 Six Seat Upholstered Booths Typically 60", 66" and 72" Seat Lengths. so that customers are not sitting where booth seats are joined together. Above Photo Courtesy Of Assembly Design Studio, Boston, MA - Used By Permission. Standard Size Half Circle Restaurant Booth Is Approx 48" X 84" X 48"
Other sizes are determined by booth style, table size, room layout or your specified preference. Standard Size Three Quarter Circle Restaurant Booth Is Approx 48" X 84" X 84" X 48"
Other sizes are determined by booth style, table size, table shape, room layout or your specified preference. 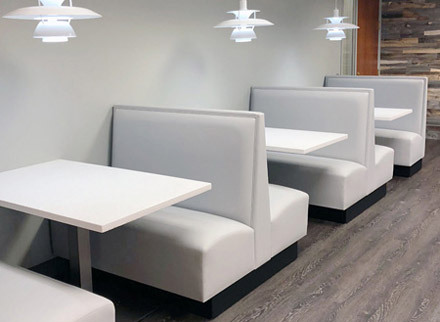 Use Backless Upholstered Wall Benches In Restaurant Customer Waiting Areas and Lobbies. 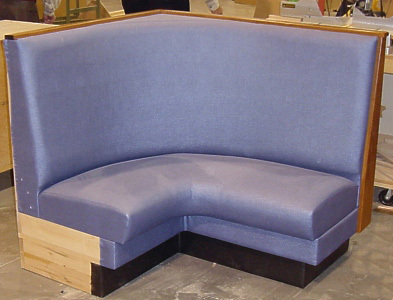 Upholstered waiting benches are approximately 19" seat height in standard and continuous custom lengths. The best thing about booth crumb rails is that they're easy to clean. The problem with booth crumb rails is that they need to be cleaned all the time. They also add some cost. If this is a booth feature you really need to have in your restaurant and your staff will keep up with the extra work of cleaning, consider crumb rails in a color coordinated vinyl material or laminated plastic. Crumb rail construction techniques may vary with booth style. 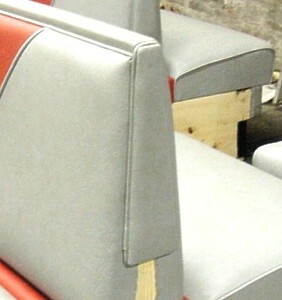 Upholstered restaurant booths finished two ends. View from inside restaurant left and view from street side right. 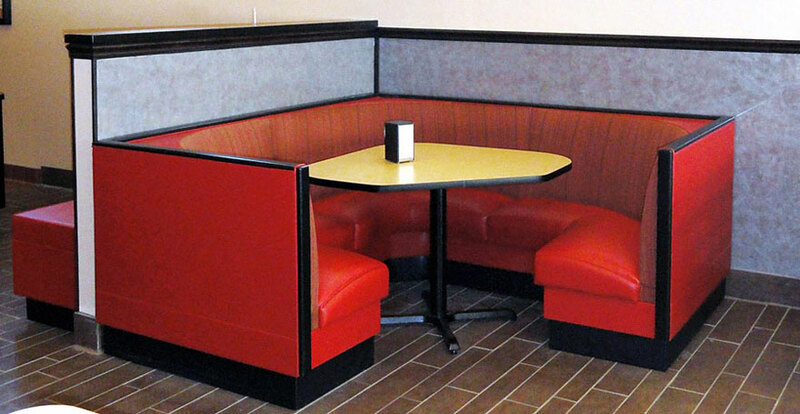 Be sure to specify finished or unfinished restaurant booth seat ends. An unfinished end is the best way to fit a booth flush to the wall. If the seat end is concealed by a wall or a divider you can usually avoid the expense of finishing that particular surface. Of course, if the booth seat end is exposed to view in the original plan or may be moved later on, having it finished in the factory is most practical. An unfinished end is the best way to fit a booth flush to the wall. It also helps to reduce booth cost. Unfinished ends are unsightly though and care must be taken if your window sill heights are less than 36". A typical booth height is 36" and the unfinished ends may be visible through your windows as your customers enter and leave your store. Plan ahead! Partially finished booth end construction techniques may vary with booth style and other requirements. 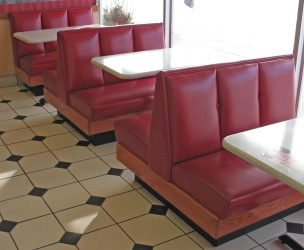 Most upholstered restaurant booth styles have seats that are removable for cleaning and repair. Be sure to specify finished or unfinished booth seat backs. If the outside booth back is concealed by a wall or a divider you can usually avoid the expense of finishing that particular surface. Of course, if the booth back is exposed to view in the original plan or may be moved later on, having the back finished in the factory is most practical. A restaurant's booth seating areas are often the most desirable seats in the house. The cost of buying restaurant booths comes as a shock to many uninitiated operators. 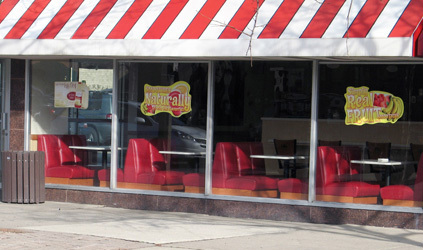 If the restaurateur acquired booths as a part of purchasing a restaurant business and discovers later that the booth seating needs to be replaced or repaired he can be frustrated by the choices the market offers. Your existing booth seating may be a big asset with a lot going for it and some consideration should be given to keeping it. 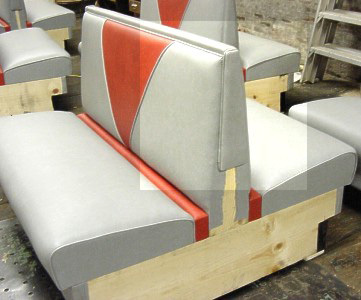 However, it is not so simple to get existing seating refurbished and recovered. A good upholstery shop is going to advise against patching tears and punctures. Such repairs are unsightly and temporary at best. 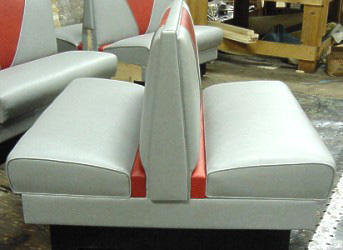 A good shop will want to strip the existing upholstery material, re-build your seats and completely recover them. If the wood booth frames were cheaply constructed originally there may not be much worth saving by reupholstering them. Look for at least some hardwood construction components in your old booth frames. If the booth frame is entirely made with plywood it may be a tip off that it will be difficult to salvage the piece as cheaper manufacturing materials were used. 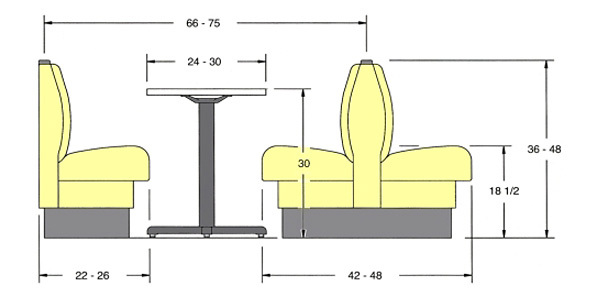 If you know who the original manufacturer of your existing booth seating was you should be able to research that company's relative quality standing in the restaurant furniture industry. The skill and resources of the firm hired to do the booth recovery work is also an important aspect of making the repair versus replace decision. Anyone who specializes in this type of work should be able to offer you some local references. You and your repair contractor also need to determine if the work can be performed at your location during off hours or at the contractor's shop or a combination of both. Salvaging your existing booths will keep them out of a landfill, you won't have to pay freight charges to get them to your restaurant and you won't have to pay hundreds or even thousands of dollars in sales taxes for a new restaurant booth purchase. The money you pay to get them fixed stays in your local community. If you are fortunate enough to find a cache of used booths you think you can use in your new restaurant make sure you can really use them. Many states and localities may have fire codes that changed since your used booths were made and installed. 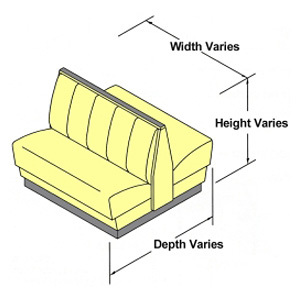 While a fire inspector may give you a pass because your seating is used, it is just as likely he won't. Plus, you really do want your new place to be fire safe anyway. Old booths can smell. If your used booths have been recently removed from closed restaurant this probably won't be a problem. If they have been stored in a basement or unheated warehouse space for any length of time you might want to check them out carefully for musty, cigarette or spoiled food odors. There professional cleaning services or odor-absorbing techniques you can employ to avoid bringing the odor of your bargain used restaurant booths into your new restaurant. http://www.howtodothings.com/home-garden/natural-cigarette-odor-remedies-for-wood-furniture In addition, be wary of used upholstered booths that have been carelessly stored. The wood frames may be warped. Make sure that used booths placed on a flat surface are still level. Reusing another restaurant's old booths requires some creativity, imagination and common sense. Be sure you can buy enough single end booths to actually make use of the easier to find and more plentiful double booths. Ending a row of booths with a double looks poorly planned and will cost you in wasted space and seating capacity. 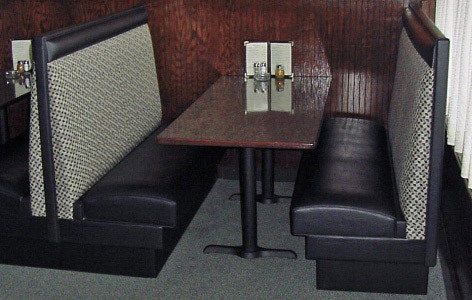 Most upholstered restaurant booths are finished on the aisle end and not on the end facing the wall. This makes no difference with double booth seats but a single booth finished only on one end is directional that is, finished right OR finished left. Single booths finished on two ends and finished on the back of the back are a true find and can be used anywhere in your new layout. Corner booths and circle booths pose the same finished end finished back dilemma. A corner booth that looked great in its original setting may not work in your new restaurant space if the unfinished backs are exposed to view or can be seen from outside through a window. Be certain that the seat lengths of the used booths fits your menu and foodservice style. An upholstered booth with a seat length of 42 inches coming out of a snack shop may be perfectly serviceable and in good condition but inappropriate in a fine dining establishment. Especially if other areas of your restaurant have more spacious, larger scale seating.